Many run, but few finish well. The truth is that it’s not how we start in this life, but rather how we finish. Persevering to the end is an expectation for the Christian; but perseverance is more than eternal security, it is that which speaks to a guarantee of a righteous life. 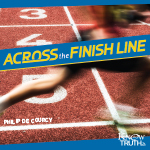 Through the account of biblical heroes from Hebrews 11, Philip De Courcy encourages those who may have strayed into sin but refuse to remain there.